My thanks to @jaharmi for having the 2013 link available on his blog. Like him, I’m posting these links because I want an easy way to find them later. I had an interesting issue crop up yesterday. 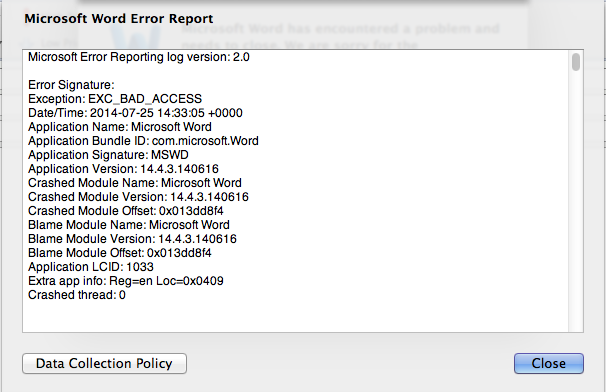 One of our users sent in a ticket to report that Word 2011 on her laptop kept crashing with an EXC_BAD_ACCESS error. None of her other Office 2011 applications were exhibiting the behavior; it was specific to Word 2011. When this error has cropped up in the past, I’ve fixed it in the past by removing Word’s Normal.dotm template from /Users/username/Library/Application Support/Microsoft/Office/User Templates or removing the com.microsoft preference files for the affected application from /Users/username/Library/Preferences. As part of Firefox 31’s release, Mozilla made a change to enable support for NT LAN Manager version 1 (NTLMv1) network authentication when connecting to sites that are using HTTPS to allow encrypted communication via SSL between Firefox 31 and the website in question. This is to address the change made in Firefox 30, which disabled support for NT LAN Manager version 1 (NTLMv1) network authentication for sites using either HTTP and HTTPS. NTLMv1 authentication to sites using HTTP is still disabled by default. For more information on why HTTPS is now enabled while HTTP remains disabled, this Mozilla bug report discusses the issue. A way to tell if the NTLMv1-using site you’re trying to access is using HTTP or HTTPS is to check the connection address. If it begins with https://, you should be OK. If it begins with http:// , Firefox 31 will still block NTLMv1 authentication. If you need to enable NTLMv1 authentication for an HTTP site that uses NTLMv1 authentication, Mozilla has provided a workaround to non-Windows users of Firefox, in the form of a setting that can be toggled to allow NTLMv1 authentication. This workaround should allow Mac and Linux users to continue using NTLMv1 authentication on HTTP sites, which will allow access again to SharePoint-based or IIS-backed web applications. For those folks who need it, I have the workaround documented here. The Linde Group has released a new tool on Github: AutoPkgr, a GUI interface for AutoPkg. In my working with the initial release today, I’ve been impressed with the problems it solves for Mac admins who want to get started using AutoPkg but aren’t sure where to begin. 3. Acceptance of the Xcode license agreement. 4. A logged-in user to run the AutoPkgr application in. This user can be a standard user or have admin rights. Once the prerequisites have been met, see below the jump for details on installation and configuration. Penn State MacAdmins 2014’s communication lines ran in a number of directions, with few more important than Twitter. Thanks to Michael Lynn capturing presentation links from Twitter, links to most of the presentations can be accessed below the jump. These presentations can also be accessed via AFP548.